I took a photo with my crappy cellphone camera and we continued onto the party in good spirits. We arrived amidst some drama – a female friend of the birthday girl had brought her jerky boyfriend with, and no one liked him or the way he treated his girlfriend – and the host of the party had just let him know it. This led me to ruminate a bit about the differences between when Becky and I had dated years ago and our relationship now … and how I was glad to be in a place where her friends didn’t regard me with justified suspicion. Waking up the next morning, we talked a bit about the differences between then and now, and the conversation about our younger, punker, dumber days turned to reminiscing about the night Becky and I had first met – she told me that with the facial hair I’d had at the time, I’d reminded her of Wolverine, from the X-men movie. Still laughing about the idea of me as Wolverine and Becky as Jean Grey (she has the same color hair), I went over to the computer, wanting to check to see what the day’s weather was gong to be like. We both still had “Don’t Stop Believing” in mind from the night before, because just as I pulled up my iTunes to find the song, Becky requested I play it. Jean Grey: Girls flirt with the dangerous guy, they don’t bring him home; they marry the good guy. Jean Grey: Logan, the good guy sticks around. i met the second lead singer of Journey in the L.A. VA the day before i departed the country… richard something or other…. This is a great website. Have been checking out as many synchronicity/coincidence sites I can find and this one might be the cutest (I mean that in a good way). Have had a big run of something happening in the past two weeks. I would say I’ve always been a mild believer in the meaning of synchronistic events but now I’m getting freaked out. I submitted a fictional story to X last week. About 5 days before the submission, major elements of the story started popping up in my everday life. I now have a list of 30. 5 of which are completely unbelievable, 15 more are freaky, and the other 10 are prob just from my heightened awareness. One of them was the puppy from England rescued from the sewer pipe. Okay, my puppy was rescued from a well but he’s on TV in the story too. Now, when does a puppy story end up on the Today show? The last big one was yesterday, when I went with a friend to his doctors appt (so I did not determine the time or place) and ended up sitting next to an elderly woman who pulled out knitting. It’s probably been 10 years or more since I’ve been in a room with someone knitting. and yes, one of the major characters is an elderly woman who knits 3 times in the story. I’m writing more stuff about synchronicities today, so if it’s ok, I’d like to add a link to your blog. glad you like it, it’s a weird balance to strike between my extremely rationalist and extremely mystical tendencies … I do lean/yearn more toward the latter, but that very bias makes my rationalist side all the more suspicious of all this … part of what I’m hoping to do with this blog is achieve some kind of integration/truce state between these extremes. I actually think that it is rational to accept that at least some of these coincidences are indeed indicative of forces/connections at work that cannot be accounted for by any scientific materialist framework yet devised. Well, it’s an interesting tug of war, and I’m enjoying it! Wow! I just happened across your blog today. I’m very much enjoying your posts… But this one put me in awe. Yesterday I saw a picture of that stop sign! 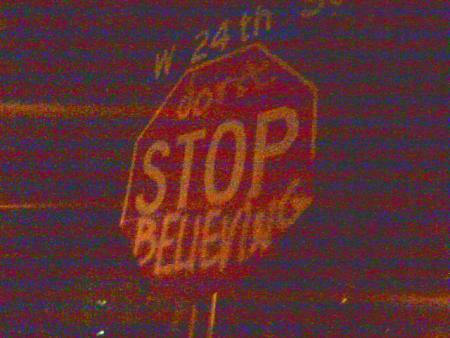 Don’t stop believing is sorta a mantra if mine. Now even more so. I feel like I’m on MY path again. Thank you.